Our Clear Lexan Plate lets you see thru to the router. Allows you to easily identify any issues or clogging you may have with the router. 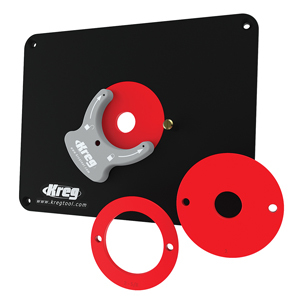 The Clear lexan Plate comes with 8 pre-installed leveling screws for easy adjustment for leveling your plate to the router table once your router is attached to the plate. 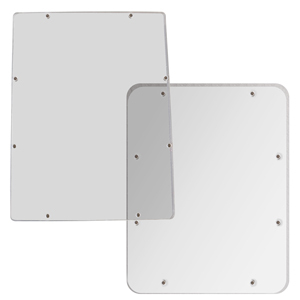 Clear Lexan Plate 9" x 12"
Clear Lexan Plate 9-1/4" x 11-3/4"
Inverting your router in a router table allows for safer and more versatile operations. Our deluxe router table insert is made from reinforced high pressure plastic. Large 9" x 12" x 3/8" thick design accommodates heavy routers and features Snap Out Rings for different size opening for various size cutters. The shoulder pin (included) allows for easy free hand work for molding, styles, rails and miters. Also comes with Cam Action Adjusters for snugging the plate to the table and eliminating side to side movement and locking it in place. Threaded Allen wrench inserts in each corner help you level and easily adjust the router insert with your table. Our Premium router plates are available in the two most popular sizes: 9" x 12" & 9-1/4" x 11-3/4", both which are precision ground and manufactured with the same great features! The plates are pre-drilled to fit our cam action corner adjusters. The Cam Action Corner adjustment eliminate side to side play or movement in your router table plate when placed into your router table. The adjusters work by simply turning the offset cam clockwise until it puts firm pressure on the inner side walls of the router table. 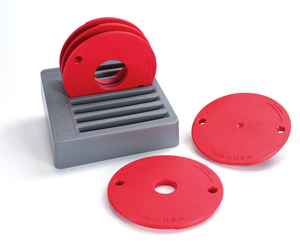 The Premium Router Plates also feature removable rings, in which the outer most ring is secured with screws and rubber grommets to ensure the ring is precisely leveled. The plates also come with a standard starter pin for making free hand work easier. The starter pin allows you to make cuts like panels for cabinets, molding, and miters. Premium Phenolic Router Plate 9-1/4" x 11-3/4"
Premium Phenolic Router Plate 9" x 12"
A lot of times, when you place your router plate with a router attached to it into your table top, there is quite a bit of play from side to side or back and forth. Our cam action side adjusters remedy this problem by applying Firm pressure to three points. The cam action side adjusters work because of an offset drill hole, which pushes the edge of the adjuster tight up against the router table opening when you rotate the adjuster clockwise. Includes three cam action side adjusters. Note: Drilling and countersink of router plate is required for proper installation. This rugged 3/8"-thick phenolic insert plate is designed to provide a solid, flat, and perfectly level mounting surface for your router. Measuring 91/4" x 113/4", it will accept almost any router (even large, heavy models) with ease. The plate is equipped with our Level-Loc Reducing Rings that allow you to easily change the size of the opening around the router bit. These rings simply twist into place using an included ring wrench to lock in level and flush with the plate surface. The plate comes with three Level-Loc Rings: 1", 13/16" (for use with universal-style guide bushings), and 25/8". The Precision Router Table Insert Plate is available in three versions, so you can choose the one that best suits your needs. This plate comes without any predrilled mounting holes. Alignment marks engraved on the underside make it easy to center and mount any router using the detailed instructions that are included with the plate. 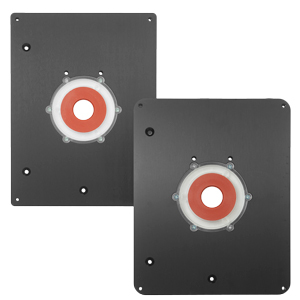 This plate comes with predrilled holes and mounting hardware to fit Triton M0F001 and TRA001 Routers. With modification, the hole pattern also works with the Porter-Cable 7500 Series. This plate comes with predrilled holes and mounting hardware to fit the Porter-Cable 690 and 890 Series, along with the Bosch 1617. 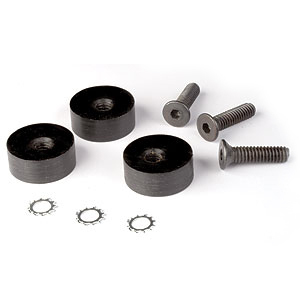 This five-piece set of Level-Loc Reducing Rings fits the Kreg Precision Router Table Insert Plate, as well as Precision Router Table Lift, allowing you to customize the size of the opening around the bit. The set includes rings with 3/4", 13/8", 15/8", and 21/8" openings, plus one “blank” ring that you can use to create your own custom-sized or zero-clearance ring. The set comes with a molded storage tray that has slots to hold all five Level-Loc Reducing Rings, plus slots to hold the three rings that come with the Precision Router Table Insert Plate or Precision Router Table Lift. Each slot is marked with the opening size, making it easy to keep the rings organized. These unique levelers are the easiest way to add an insert plate to your shop-built router table. 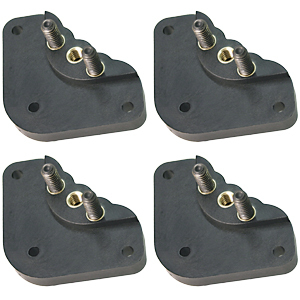 They eliminate the need for a supporting rabbet and feature a unique bottom-mount design that includes eight adjustable points of contact, four-corner lock-downs for stability, and locating tabs for easy installation. Centering a router plate to a router can be very difficult. One of the biggest issues is making sure the center hole on the router plate perfectly aligns with the center of the collet on the router. The EZ-Align Router Plate Centering Kit makes this process much easier and is right on every time. 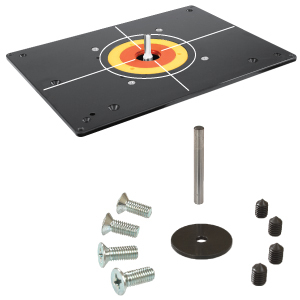 The kit comes with a unique centering disc that fits neatly into the router plate opening* for accurately centering the router plate on the router. Also included are 4 longer replacement screws to accommodate the thickness of the router plate if necessary. Comes with full instructions to walk you through the simple process step by step. *Note: Your router plate should be the standard 1-3/8" recessed hole that accepts Porter Cable™ style bushings. All screw sizes listed below may fit other routers not listed. Please be sure to check your router base screw size before choosing.